Alex Weldon: I think it's worth noting that, when building on the side, you get one side (the edge of the goban) for free. So then the most efficient shape is a rectangle of width twice its height, not a square (in the corner, you have two sides, so a square is better). Build rectangles on the side. White has actually invested one stone more than Black (19 vs. 18), but Black has 32 points of territory to White's 30. 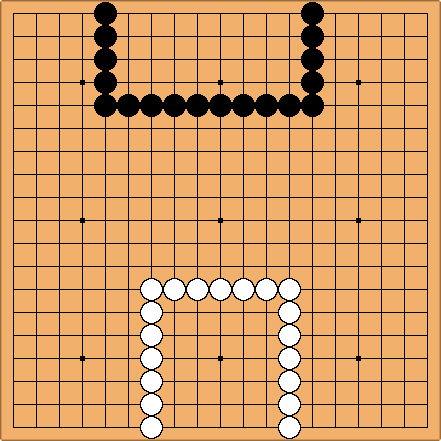 Because the side of the board forms one side of the territory, stones played to increase width count more than stones played to increase height (unless the width is already much greater than the height). 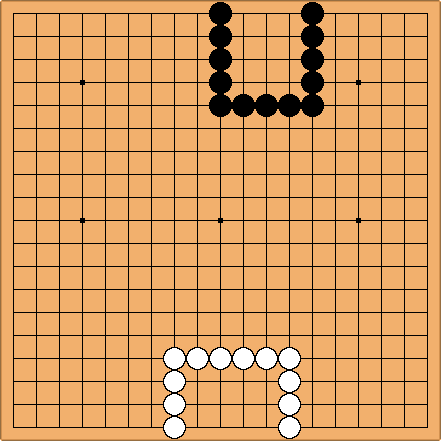 Perhaps that's why it's often better to extend along the third or fourth line in the opening and early middle game, rather than building one's moyos upwards. Of course, the fact that territory built higher up is easier to reduce and harder to defend is also important. 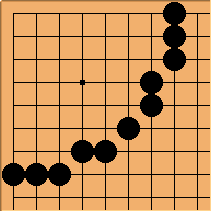 Bill: In one of his books, Ishida Yoshio repeats the argument in an article in Kido by a mathematician, who claimed, based upon efficient rectangles, that running along the third line (under the opponent's stones on the fourth line) for more than 6 points is inefficient. A sphere has the largest area with the same perimeter. A square is the world champion amongst the rectangles. So, if you want to get a lot of land with minimum number of stones, don't build stripes. 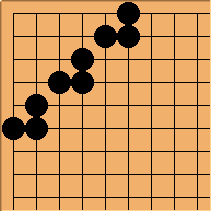 Alex Weldon: This is balanced, however, by the fact that it's easiest to make territory in the corner and along the sides, where you've already got one or two boundaries covered by the sides of the goban. 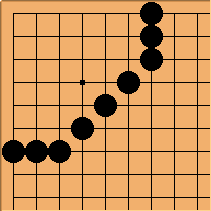 Therefore, your stones running parallel to the edge of the board count double, since any upper bound you make is effectively mirrored by the edge of the board under those stones. Since we're now talking about optimising profit xy with investment x/2 + y, your most efficient shape for building along the edge would be a rectangle twice as wide as it is high. In the corner, however, you've got two edges working for you, so your investment is doubled both ways, so we're talking about a square again. Anonymous: This is a competition to surround the largest area using the least amount of stones. 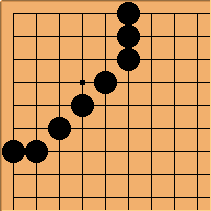 It has been claimed that a circle is the most effective method, while others have claimed that the existence of the sides of the goban make that statement obsolete. I believe you can't play at 3,3 and live, although it looks like they could be cut. Looks like you could be exposed to double atari. Maybe I need to make the circle bigger? It's hard to make a circle on a rectangle. I could try to make it bigger, but I think it may result in an increased possibility of a successful invasion at the 3,3 point. Still doesn't look like much of a circle. Dan: well for any of this the best metric I can think of is (Contained Area)/(stones in perimeter) which gives you area contained per stone which will allow a 1:1 match up between various shapes and a higher number means a better shape up to the point where invasion becomes a major threat for any given shape.